Is the new year inspiring you to get back into shape? If so, you might want to try an exercise tracker, group fitness or high-intensity interval training (HIIT). These are the top three fitness trends for 2019, according to the American College of Sports Medicine, and each has been ranked highly for several years. For its 13th annual forecast, ACSM asked more than 2,038 fitness professionals employed by commercial gyms, medical facilities, nonprofit organizations and corporate health programs to rank 39 possible fitness trends. Among some changes and surprises, core training and circuit weight training fell out of the top 20 trends, while Pilates and online training didn’t make the top 20. Here’s a look at the top five in ACSM’s Worldwide Survey of Fitness Trends for 2019. Although the survey results indicate that we love to measure our outcomes, the continuing popularity of group fitness, at No. 2, suggests we don’t want to compete just against ourselves. 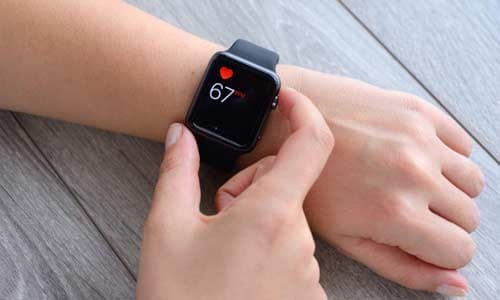 “Some smart psychologist out there might say the millennials have access to all the technology in the world, and yet they still want to be part of a community,” says Thompson, referring to the generation the health industry is most interested in capturing. Group fitness, of course, is not something new. But Maier argues that it is different from what we saw in the 1970s and ’80s with personalities such as Richard Simmons. “It’s driven by boutique studios that do one thing and they do that one thing well. It’s inspired everyone to up their game,” Maier says. “A cycling class today is much better than just a few years ago” because it incorporates more aspects of exercise, such as varying levels of intensity. Instead, HIIT has taken the country by storm as people try to squeeze in an effective workout between 1,000 other obligations. This is the case for Patrick Serfass of Washington, who has two young children. Serfass used to do triathlons and run multiple races every year, but since he became a father a few years ago, time is short. HIIT is a great candidate for group fitness, because it’s hard to self-motivate at that top level of exertion, says Maier, who is also the managing operator of F45 U Street, a new group training studio that incorporates HIIT, body-weight and circuit training. “No one is going to want to do [HIIT] on their own. It’s more realistic to do it in a class and have a coach who knows what they’re doing,” he says, adding that keeping track of the timing of 20-second drills, short rests and the number of reps can already be overwhelming. No. 4 is fitness programs for older adults, defined as baby boomers (born 1964 and earlier) and older. Baby boomers are retiring in record numbers but are not slowing down, according to Thompson. “The gyms are increasingly offering specific fitness programs for older adults,” he says, adding that it’s a financial incentive for gyms to fill the “dead time” between 9 and 11 a.m. and 2 and 4 p.m. This is prime time for older adult programming, and some gyms are making their atmospheres more appealing to this demographic by softening music and lights. No. 5 is body-weight exercise, which started staging a comeback during the recession about a decade ago, Thompson says, when fitness buffs were looking for sustainable alternatives to joining gyms and gym managers were seeking ways to cut back on expensive, hard-to-maintain equipment. Popular and effective body-weight exercises include planks, lunges, squats, pullups, rows and roll-up/roll-down situps. Serfass says he likes this kind of exercise because it is the epitome of functional, everyday movement: Lunges mimic getting out of a car, roll-up situps mimic getting out of bed, pullups (and easier modifications) are similar to getting something off a high shelf and rows are like opening a heavy door. One trend that has held steady for many years is yoga, which is in the No. 7 spot. “Unlike Pilates, which got stale after awhile, yoga kept changing. That’s why it’s still so popular,” Thompson says. Maier agrees, noting the “blurring” of the lines in classes in which yoga is fused with another discipline, such as weight-training. “Yoga is not the flavor of the month but it’s not going anywhere,” Maier says. One trend sorely missing from the top 20, Thompson says, is fitness for kids. It is estimated that about 18.5 percent of American kids ages 2-19 are obese. Thompson says gyms haven’t figured out the logistics and economics of getting kids to the gym in the afternoon. In school systems, nonacademic subjects such as art, music and physical education are often fighting for limited time and resources. “Ideally, kids have an exercise program that they can enjoy and do on their own,” Thompson says. So, maybe that’s the New Year’s resolution: Find yourself and your child a program to enjoy and do on your own – or better yet, together.